Professor Lee Cronin holds the Regius Chair of Chemistry at the University of Glasgow. Research in the Cronin Group is motivated by the fascination for complex chemical systems and the desire to construct complex functional molecular architectures that are not based on biologically derived building blocks. They are developing a new approach to the chemical sciences which they call Chemical Cybernetics. This combines robotics, algorithms, flow chemistry and reaction programming. Over a number of years, Professor Cronin and his colleagues have used use a lot of integrated techniques to explore chemical reaction systems. For example, one networked flow and flow systems including mass spectrometry, IR, UV and NMR. The recent advent of benchtop NMR and having been inspired by previous self-optimised flow systems with in-line analytical monitoring, the Cronin Group has extended this concept so that multinuclear and 2D NMR can be performed in the fume hood. 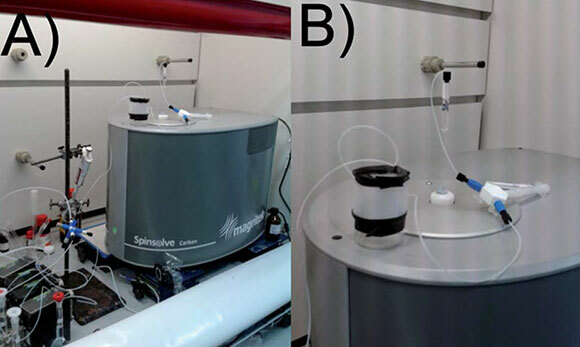 The Magritek Spinsolve benchtop NMR provides analyses from the single sample in a standard 5 mm sample tube to performing in-line 1H, 13C 19F and 2D NMR analysis. They have also combined in-line 1H NMR with computational techniques to make a self-optimising reactor. They have taken their benchtop NMR system an d created a flow system using nothing more than simple plastic tubing and non-dueterated solvents. Previous systems integrating in-line NMR spectroscopy had been limited to bypass configurations, flow cells in high-field magnets or applied microfluidics. The Cronin approach takes advantage of a compact permanent low-field magnet (43 MHz) based on the Hallbach design. As reported in a recent paper in the Royal Society of Chemistry journal, Chemical Science, “Despite the low field of the magnet, Spinsolve has remarkable sensitivity and stability.” See the reference below. Chem. Sci., 2015, 6, 1258-1264 “A self optimizing synthetic organic reactor system using real-time in-line NMR spectroscopy”: DOI: 10.1039/c4sc03075c. (This is an open access publication).